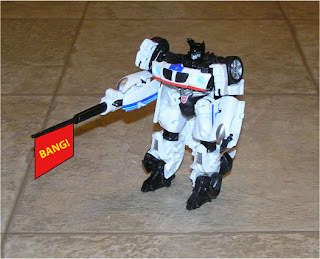 Okay okay, I'm not THAT lazy, here is Jazz Transformed. He's fairly a proportionate robot, his legs are a little big, and his shoulders are kind of boney. I'm not sure why his front grill has a springy thingy inside, and the sides are on hinges? I really like the telescoping weapon! Too many Transformer weapons are based off projectiles. They don't all have to shoot things. Beast Wars always did a good job of alternative weapons too. Like Rhinox's spinning saw blade weapon with the maises. I guess my toy luck is improving again. After the debockle trying to get the 25th Anniversary Joes my luck changed back to good as I ran into Target Jazz (with only 2 left to spare) Now I have a pretty good modern G1 collection going. Don't like the difficulty on the new Movie Transformers though, takes too much time and effort to go between forms, Jazz looks beter in car form anyway. 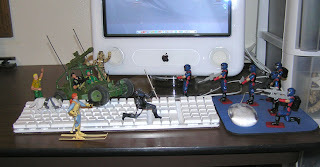 I would probably collect the Fast Action Battlers if I really wanted movie stuff. Maybe even the step below that. I have become an impatient transformer of Transformers. Pepsi's Transform Your Summer: what a dud! 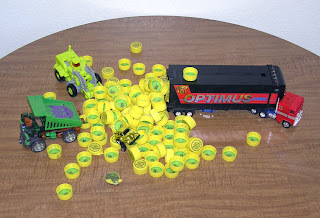 I really wanted to win a Pepsi Optimus Prime. I tried my hardest to win, but was shot down. It doesn't bother me, but it's the Transformers who loose in the end. My only hope now is a friend at work says they were sent $20 dollars months after one of those contests ended without any notice of a win. Perhaps that will happen to me. You might say with Ulysses launched and on its way, I have chickens on my mind more than most days of late. Okay okay, enough with the plugging. I went to Captain Comics Fair booth where with a spin of a game wheel, (designed by the company I work for) I won two free comics! I got to pick from a few full boxes. 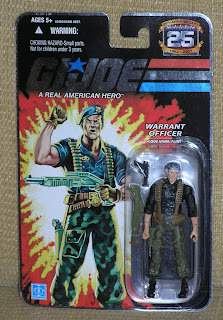 My first though was since I am hyper GI Joeing at the moment I would look for that American Hero - But I got double lucky and found one of those cross-over deals GI Joe and Transformers from 2003 or so. It was a fun read, got issues 5 and 6 out of 6 so I got the end of the story. I was excited to see Optimus Prime as My Favorite Cobra Hiss tank! (not sure why he was dressed as a bad guy though-he acted good still) I also liked how all the other Transformers were still G1 styled. Ken at work borrowed it and said "that was worst comic I have ever read." Hmmm guess that last sentence killed some of the thunder of most of the paragraph. 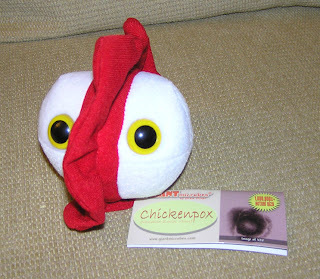 Pleased at winning two comics that I like, I returned the favor and bought some Chicken Pox. I always wanted one of those stuffed germs. 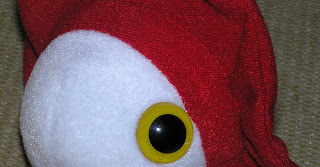 Chicken Pox fits my theme for the moment as well. Runners up were Ebola (painted brown-looked like somthing you would see in toilet- yuck) and some strange green thing with stringy flagelums. I was surprised to see so many STD stuffed animals. What a way to surprise a loved one of their possible future aliment! Ulysses Chickens in the Wind? You might have noticed I made a second blogger site that would feature this comic. At the time I wasn't too motivated, but of late I decided that I have been watching WAY to much TV, and producing nothing to show of it. And my comic-ing talents seem to be waisting a way a bit, I thought I better at least sort of try and dust things off. I am actually very mad at myself for not having a web comic site up, since that is what I really like doing; writing comics! So I ran into Smack Jeeves the other day, and though, this would be the place to at least get the pen rolling again. Where you will find fantastically rendered art in edge of your seat story lines! All juxtaposed next to some of the finest Emo, Sonic the Hedge Hog, Gothic, and really quite scarry 'alternative' comics around. Strange rummors a foot that Sky-Lynx might be reissued! I'm sure it have a heafty price, but maybe less then the mints on ebay. This whole thing of Mattel toy recalls on account of a .03% lead base paint is so over blown. 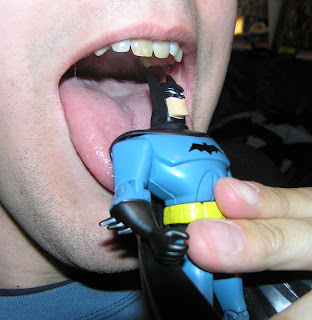 For example, I have been licking this Batman action figure for years now, and I'm perfectly fine. Stupid recalls, this is all an attack by Organic Toy companies trying to take over the dominant Made in China market that produces so many cool toys. I say, go to the store and buy more toys! aaand this wins the most disturbing post award. 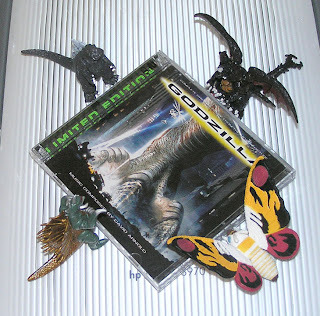 Godzilla Limited edition Soundtrack at long last! It's about darn time! If I haven't mentioned it before, I am a big movie score fan. I don't think I own any other kind of music cd besides a movie soundtrack (not to say I don't like other kinds of music-Celine Dion is the greatest singer in the world). Such was the case with Godzilla. Maybe since the movie didn't make expectations, they decided that no one wanted to hear the soundtrack. I would like to summon Godzilla himself to eat that person. Godzilla composed by David Arnold (remember my Casino Royal rant) is one of the greatest scores ever made. It's pure power in the action music department. It also has a thunderous main theme, zippy hero clips, sappy love music, and emotional defeat themes. It's about time a limited edition, 2 cd, one hour 40 minutes of music soundtrack was released. Only 3000 copies were made + the one I let Jeff "borrow". #13 Animals Camera - when Hank Azaria chases Godzilla to get a good video of him. The heroic score comes out for the first time. #21 1st helicopter chase- A nice action music go, setting up many many more to follow. #3 (cd 2) Godzilla O Park/ Godzilla takes a dive/ Godzilla vs the Submarine/ egg discovery. Here is a known fact: every time the word 'Submarine' shows up in one of David Arnold's scores it is a very long, thought out, complicated action piece. The track itself could be a whole score. Many people find them to be over done and hard to follow, but once you listen a few times you will want to hit replay over and over. #9 (cd 2) He's Back!/ Taxi Chase- this is just incredible. Wow. It won't let up, I remember this scene in the movie and wanting the score immediatly to drive around town with. #10-#11 (cd 2) Big G goes to Monster Heavan and the end- Much like the powerfull music at the end of Independace Day, this is where David Arnold finnally gets the chance to counter all the bad news music from most of the movie, to good news good guy finally winning music. And what fun it is when the good guy starts winning music. So if you get a chance to get this score, where ever online by Lalalandrecords.com, or ebay. do so, its too fun to past up. 3000 is not many copys at all (it will be a good investment). 25th Anniversary Flint! At last! So tonight I thought I would check the other Freddies next to my place (strangely about the same distance in opposite directions). To my anger, just an empty peg!!! (maybe they didn't stock it yet though, who knows.) Anyhow, had nothing to do, and decided to check on a Target a few more miles out. This Target has never failed me in finding a new toy. It failed this time! I was so bummed out. So bummed out. I decided to try one last time for the night and hit yet ANOTHER Fred Meyer... sort of on the way home to the left. After pouncing on the toy aisle to find no peg at all near the GI Joes seciton. I was mega bummed now, just wasted lots of too much time on this whole hunt. Then I turned around to check other toys out when BLAM! There they were inbetween the Justice league and som Yui-gi-Oink toys! 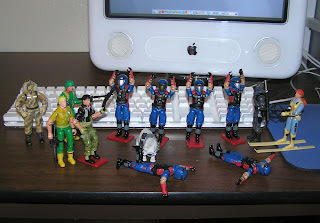 There was ANOTHER Snake Eyes, and that Storm Shadow I really don't care about, but behind them was FLINT! I can now rest. Or at least, take a breather- now I have to hunt for the 5-packs of all the other main figures. But I don't think those are in town yet anywhere. Went and saw the Fantastic 4: Rise of the Silver Surfer last weekend. Hmmm. I usually like every movie I see, but this one, kind of stuuupiiid. Oh there were a few neat parts and funny scenes but the movie as a whole was eh. I think the 15 minute running time hurt it the most. 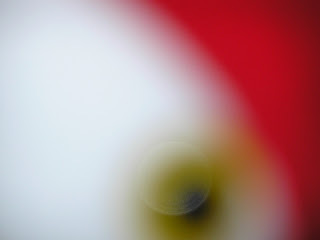 There was no time for anything to develop. I question the Invisible Women's blind desire to get married, even if it means the city she and her family is in is about to get attacked. What the heck was the military thinking about letting Dr. Doom help? Did they even watch the first movie? Galactus as a cloud, I've scene a Marvel legends figures cooler than that. (All though I would like to see a V'ger versus Galactus cloud fight.) And what the heck was with that flying car? I did like Michael Chiklis as The Thing. He does a good job looking rocky and tough-yet funny. The sharing powers by the Human Tourch was neat-o. Made a neat fight scene even if it was a stretch. 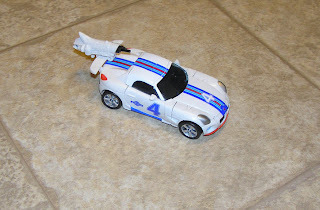 And some of the Silver Surfer chases were nice, just looked about the same in the previews. The movie was worth the dollar theatre status that I saw it in. Now, back to watching the greatest movie ever; Batman and Robin. 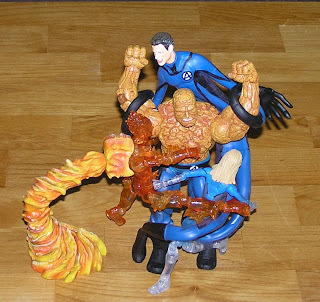 I found The Thing and Bendy Mr Fantastic at Toys R Us yesterday. They were toys still left over from the first movie! I have yet to find a Silver Surfer toy. 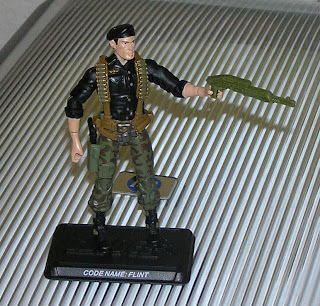 It's Cobra Viper Month!... Or not. I started doing some thinking about how short a week was, and decided to extend Cobra Viper week to a month, maybe even a year. Vipers have so much going for them and need to be shared with everyone. 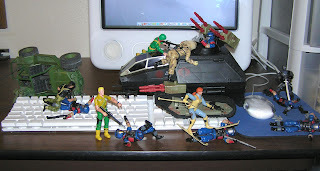 Then GI Joe had to surprise attack and ruin everything! Things got pretty scarey there for a minute. I really don't remember letting the Vipers take control of that H.I.S.S. tank, and on the keyboard too...that's totally against the rules. Well those cursed Joe's took care of my poor Viper army rather quickly. But I shall re... I mean, the Vipers Shall return again. They may have won the battle, but the war is far from over!